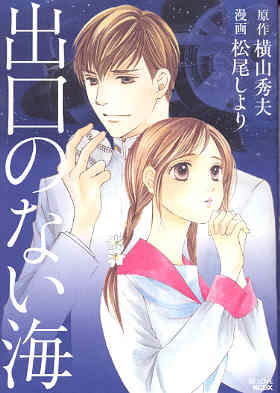 Only the kernel of Hideo Yokoyama's 2004 novel remains in this manga version of Deguchi no nai umi (Sea without exit). This manga story, directed mainly at teenage girls, has a completely different atmosphere than Yokoyama's novel and the popular film with the same title released in 2006. The book focuses almost entirely on the romantic relationship of Koji Namiki, who dies while training in a kaiten human torpedo, and Minako Narumi, who continues to strongly love Namiki during his time away in the Navy and even after his death. Namiki, a pitcher on a Tokyo university baseball team, searches for a "magic pitch" (makyu in Japanese) that will have differences in the first part and last part of the pitch. However, he soon leaves the university to join the Navy and to become a kaiten (human torpedo) pilot. Namiki goes on a special attack (suicide) mission with a submarine carrying four kaiten, but his kaiten fails to launch when an enemy ship is sighted, so he returns to base. Later during a training exercise his kaiten disappears and cannot be found. In 1945 soon after the end of the war, Namiki's kaiten washes up on shore after a typhoon. His friend Katsuya Kita, who was a member of the track club at Namiki's university and his kaiten squadron leader, finds Namiki's letter to Minako and a baseball with the following words written on it, "the magic pitch is completed." This manga depicts a much more explicit romantic relationship between Namiki and Minako than that in the book and movie. The manga story also includes several incidents not mentioned in either the book or film such as the following ones. Minako gives Namiki a little mascot doll dressed as a baseball player with his number 18 on the uniform. This doll shows up throughout the story, and he takes it with him in his kaiten. She tells him that her favorite poem from Manyoshu ("Ten Thousand Leaves," the oldest existing anthology of Japanese poetry dating back to the 7th and 8th centuries) is one that describes a woman who, rather than thinking about the man who leaves her behind, asks him to please leave signs along the road so she can follow him. In 2006 at the end of the story, Minako and Kita meet at the university where Namiki played baseball. The baseball club's trophy case displays Namiki's baseball marked "the magic pitch is completed." Minako and Kita cheer the modern-day baseball team, and the spirit of Namiki says in the last frame of the comic, "I am living in the world that you two left for me." Deguchi no nai umi (Sea without exit), which takes up about two thirds of the pages in this manga book with one other story at the end, provides little insights into the motivations of the three main characters of Namiki, Minako, and Kita. Minako's starry-eyed love of Namiki encounters no conflicts in their relationship, whereas the novel portrays their love much more subtly and describes how Namiki becomes emotionally detached from Minako as he immersed himself in kaiten training. The manga story also barely mentions or does not include many minor characters who played important roles in the book and movie. Kita finds Namiki's kaiten in this story, but Namiki's friend and fellow kaiten pilot Okita, not even mentioned in the manga, finds it in the novel. The author of this manga story with so few details may have assumed that a reader would have already known the basic story from viewing the film in a theater.